It was indeed a day spent almost entirely at home — and on such days, it is always helpful when one of the local herons turns up and looks photogenic. This isn’t the same one as has appeared multiple times — the colouring is different. And I like it’s slightly misplaced feather right on its crown. 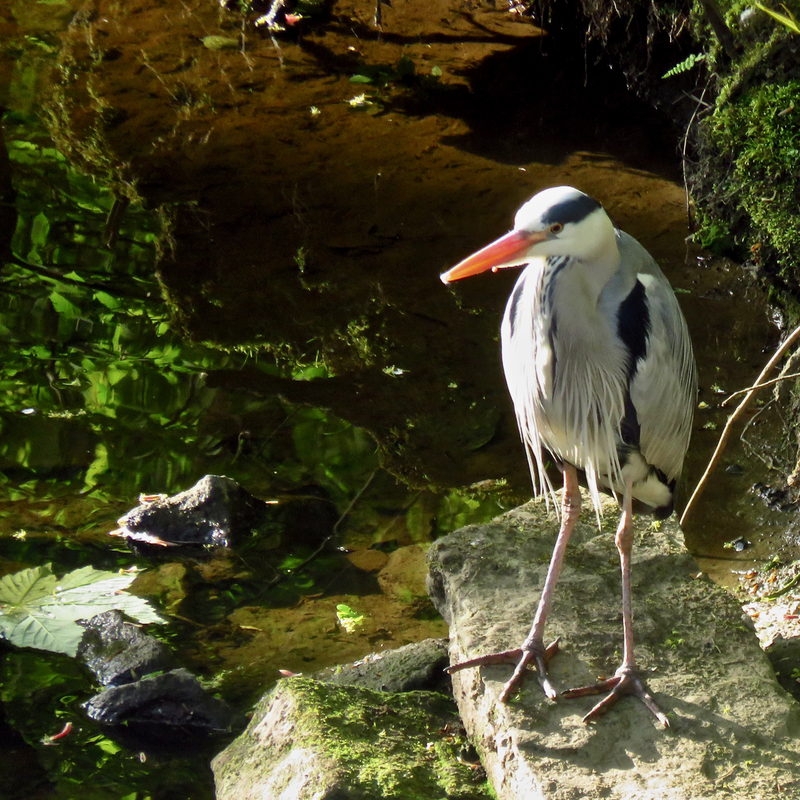 On how many otherwise boring and photograph-free days has a heron down on the river saved the blog post. Today was one of those days. Handsome beasts, always…. and damn, are they patient. 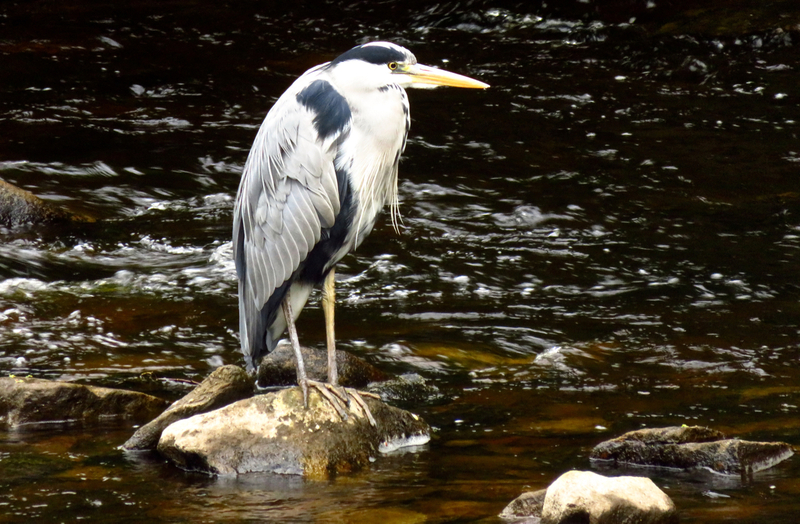 Today was not the first time that I have been grateful to spot one of Hebden Bridge’s resident heron population on my only excursion out of the house. Days otherwise spent at home, marking, are not the easiest ones on which to fulfil the daily photo brief. I say ‘one of’ the resident herons but I suppose there’s a better than even chance that this is the same bird as appeared on 25/5/16 and 17/2/16 — look at the earlier shots for yourself and see what you think. The markings are more or less the same and I guess as predators these are territorial beasts and like to keep coming back to the same spot. If it is the same one this would make it the second bird (after the local muscovy duck) to definitely appear on the blog more than once. And looking back at those other pictures does, at least, indicate just how much these guys can fold up those amazing necks of theirs. 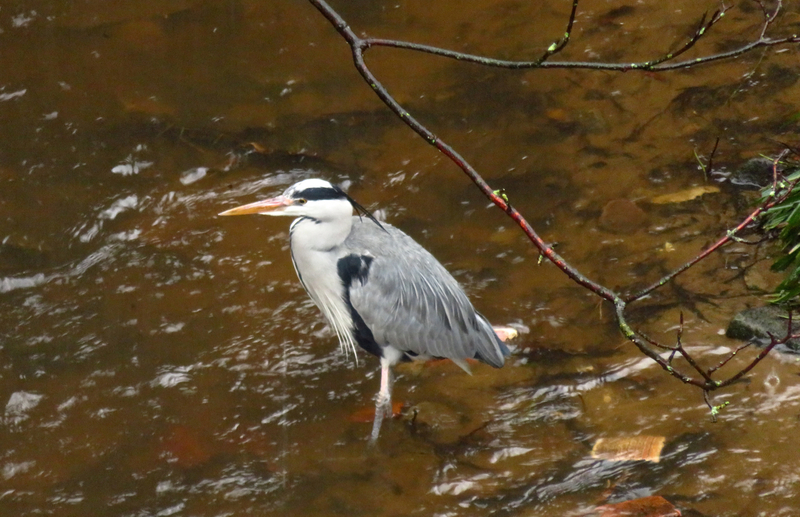 On a grey day spent entirely working at home it’s always helpful for the photography when one of the local herons turns up in the Hebden Water just below my house. They are not particularly willing models — this one saw me a few seconds after I got this shot and flew off — perhaps that explains why it looks a bit rueful here, its neck tucked in, shoulders hunched. That’s why I’m calling it “Humph”, I can imagine that coming out of its mouth in a speech bubble. 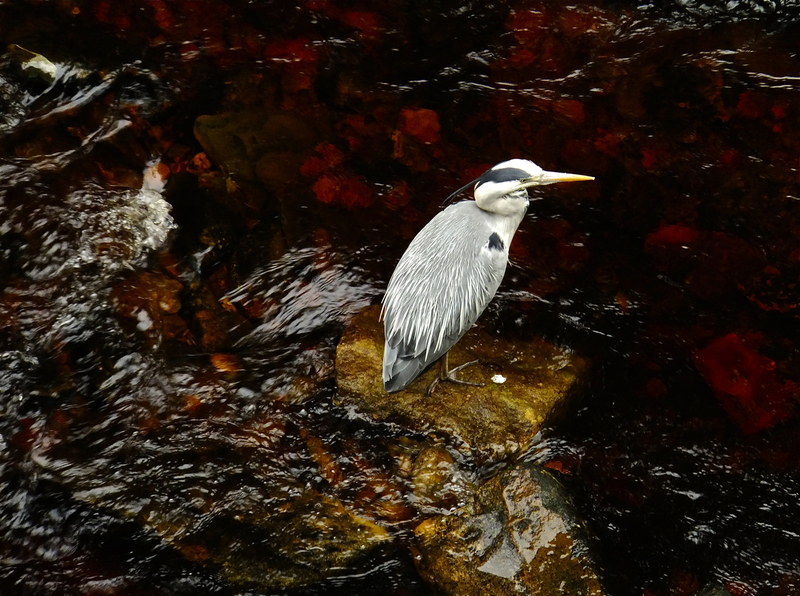 It could be sharper and it ain’t gonna win any wildlife photography contests, but I’m glad this baby was fishing in the river this morning when I went shopping down in the town, because otherwise I was home all day working and there was nothing to see…. But herons are always good for a shot. Handsome creatures. 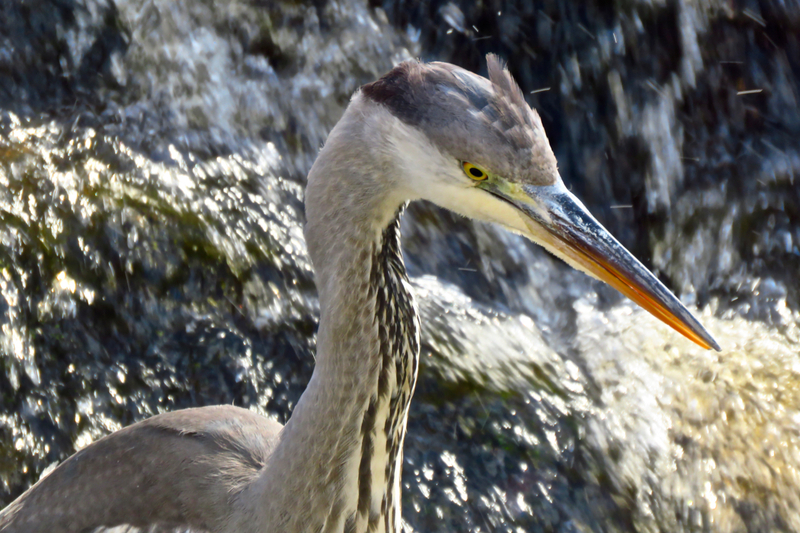 That neck-spring-and-dagger-beak combination must be a fish’s worst nightmare. Although I flew into Melbourne yesterday I’m not actually staying there this weekend, instead, I’m hanging out in Geelong which is a smaller city a bit further round the bay. I’m staying with an old university friend I haven’t seen in about ten years since she emigrated out here for work. 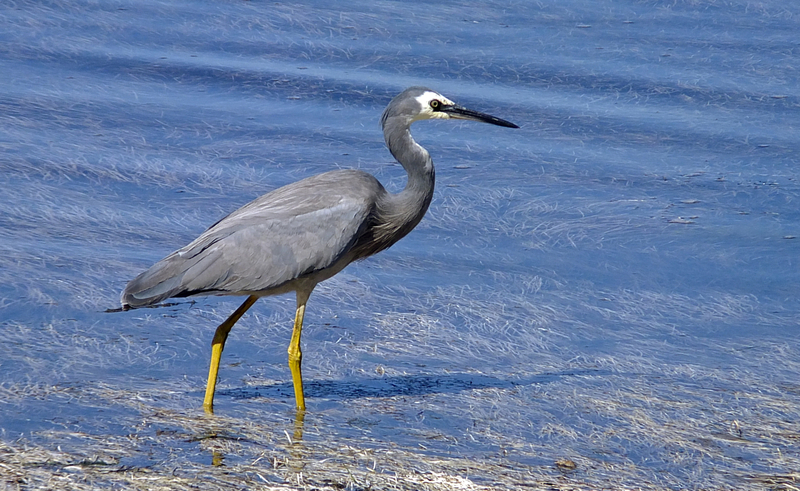 There’s not an awful lot to Geelong but, like the rest of this country, it does have some cool wildlife. I was stalking this heron for a good 20 minutes from along the path by the bay near the marina, and got a few good shots, but this one I chose because the reeds just beneath the water give it a sort of texture, and the S-shape of its neck is just beautiful. 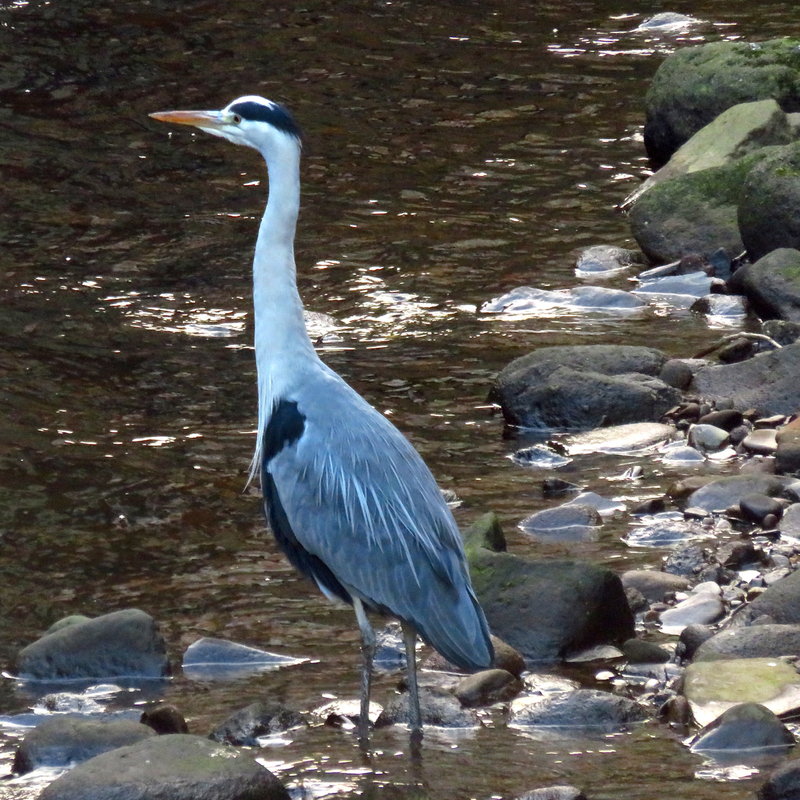 It’s the second heron to appear on the blog and the first one was beautiful too. When I was in the Lousiana swamp a few weeks back I saw alligators – we definitely don’t have them in Yorkshire. Cypresses and wolf spiders, spotted on the tour, are also not usually seen round here. But when the guide pointed out a sleek, tall drink of water of a bird with a beak like a dagger, a fish’s worst nightmare – oh yeah, we have them in Yorkshire. Really? Yes, really. 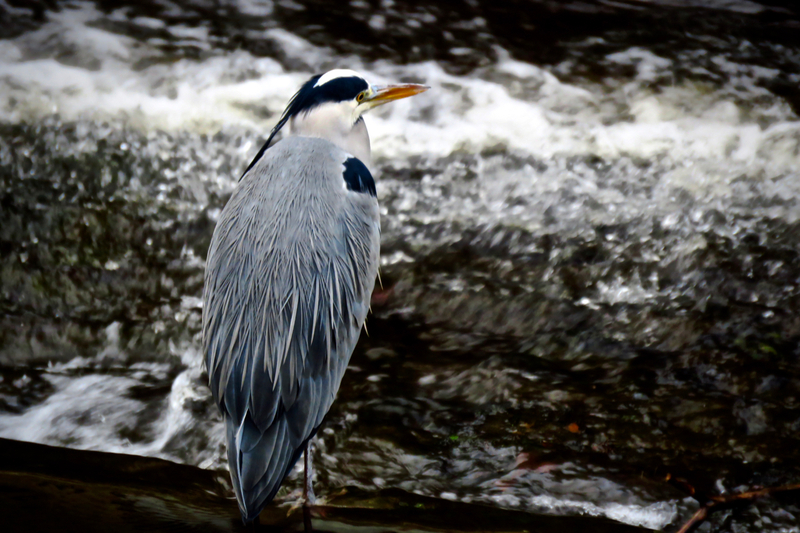 Herons often fish in the river that runs through the centre of town. And here is one, just to prove it. Handsome beast, isn’t it?